Home > Books > Food & Drink > Cook It in a Cup! Dimensions: 10-1/8 x 6-1/4 x 2-1/2 in. 64 pages. Wire-O paperback with 6 silicone cups in a box, full-color throughout, ages 6-14. 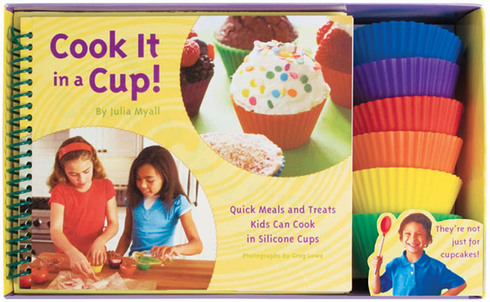 This fresh take on kids-in-the-kitchen cookbooks comes with six colorful silicone baking cups that children can use to prepare all sorts of individually sized treats, from little lasagnas to tiny fruit tarts. The silicone cups are nonstick, easy to clean, and safe for ovens or microwaves. Featuring 29 healthy recipes, each with color photos and easy-to-follow instructions, this cookbook is baked to perfection for young chefs!